Professor Robot is a government-manufactured war machine from a dimension where music is used as a weapon. 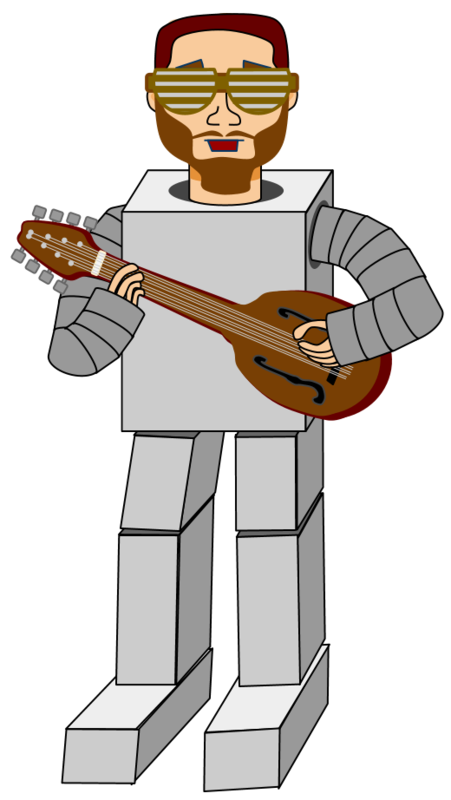 Engineered by the top sonic artillery experts Mecha Mozart, David Lee Robot, and Jimi Hydraulix, Professor Robot earned much acclaim on his homeworld vanquishing evil music. When he accidentally stumbled upon a dimensional portal one evening, he found himself in the underground laboratory of Doctor Octave, former music student currently possessed by Tesla’s ghost. Once Prof Robot and Doc Octave discovered each other’s musical powers, they decided to join together and form a strike force of deadly sonic accuracy intended to obliterate the musical forces of evil in this, and eventually all universes. They called this force Cartoon Violence.